Welcome to Coconut Walk, a luxuriously gated oceanfront estate directly on Seven Mile Beach with private pool, concierge, and water sports equipment. This magnificent home has been redecorated by Grand Cayman's premier decorator (design studio) and has been featured in a number of local magazines. A rental experience at this private estate will be like no other on Grand Cayman. A driver will meet and greet you at the airport before transporting you to the villa in a large passenger van that will easily hold all of your luggage. Our company also has a relationship with a number of rental car companies to coordinate the delivery of your rental vehicles to the villa in advance of your arrival. Pre-stocking the villa with groceries and beverages is also a popular choice by our guests. Located only 15 minutes from the airport, the heavily-landscaped winding driveway guides you into the estate and welcomes you to an oasis you may never want to leave. The Spanish-tiled two-story villa measures 7 400 square feet indoors and offers another 3 000 square feet of entertaining space outdoors around the pool area. Plenty of off-street and under-cover parking provided. The rear covered lanai overlooks the pool and barefoot white-sandy beach. The pool area sits back from the beach and is elevated sufficiently to offer privacy from any passersby. 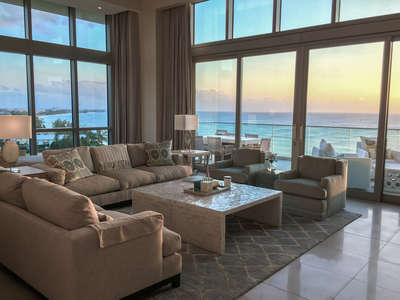 Of all of our villas, this particular property offers the celebrity or privacy-seeking guest what they cannot have while staying at the Ritz-Carlton, Kimpton Seafire, or other luxury villas in the Cayman Kai area. No one will know you are here unless you tell them yourself. • Complimentary early check-in (if no check-out on the same day). • Housekeeping services (three to four hours daily). • Day-after-arrival and midweek guest services follow up. • Use of Apple TV's, Bluetooth speakers and beverage coolers. • Gilchrist & Soames bath products. • Grocery and beverage pre-stocking (delivery fee applies). • Arrangement of Chef and babysitting services. • Complimentary Pack n Play, booster seats and baby gates. • Centralized on-island guest services and welcome center. • Unlimited use of Silver Thatch fitness centre (minimum age of 18, open daily 9:30 AM to 5 PM). • Access to business centre (computers, printer and Fedex/DHL supplies). • Proprietary Silver Thatch guest discount card. • $150 Discount for Silver Thatch Charter stingray snorkel. • Guest parcel receipt (hold for check-in). • Jacques Scott wine and spirits pre-order (hold for check-in). • Referral to preferred vendors and reservation assistance. • Airport arrival Fast-Track VIP (fee charged by CAA). • Special event and dinner reservations. • Complimentary snorkel gear, pack-n-plays, booster seats, and baby gates for check-out. Dining area under poolside lanai. Telephone available for local calls. Dedicated villa Netflix account with Ultra HD streaming on up to four screens and SONOS audio system. Life jackets, basketball and two paddle boards (signed waiver required) available for guest use. Complimentary early check-in, if no check-out on same day. Day-after-arrival and mid-week guest services follow-up. Complimentary use of Apple TV's, Bluetooth speakers and beverage coolers. Airport greeting and transportation on arrival and departure. Housekeeping services (three hours daily is included, additional hours are available). On-island manager for maintenance and to assist guests. Luxury bathrobes, blankets and luggage racks in each bedroom and cottage. Alarm system available for guests upon request. Chef, cooks, servers, masseuse and yoga instructor is available for private hire. Centralized on-island guest services and welcome center. Unlimited use of Silver Thatch fitness centre (minimum age of 18, open daily 9:30 AM to 5 PM). Access to business centre (computers, printer and Fedex/DHL supplies). $150 Discount for Silver Thatch Charter stingray snorkel. Guest parcel receipt (hold for check-in). Jacques Scott wine and spirits pre-order (hold for check-in). Referral to preferred vendors and reservation assistance. Airport arrival Fast-Track VIP (fee charged by CAA). Special event and dinner reservations. Complimentary snorkel gear, pack-n-plays, booster seats, and baby gates for check-out.